Safety first: A handrail should be installed no matter what size deck you have to help prevent physical injuries. Pro Home 1 installs secure, durable handrails that are suitable for all residential and commercial properties and are designed to provide years of worry-free use. We offer railings for decks, stairs, porches, ramps, balconies, and walkways in a variety of styles and materials. Our specialists will help you choose a handrail to match your existing fence or create a customized look to fit your needs. For a free consultation and quote, give us a call at 1-844-801-2465 today! We are your local expert for deck design and installation in Schaumburg, Wood Dale, Mount Prospect and surrounding Illinois. Whether you are looking for a maintenance-free railing system or want to add a decorative touch to your front steps, you can count on us for quality installation and products. Our handrail products always meet local and national building codes and provide superior safety. We offer railings and balusters in a variety of styles, materials, and colors to give you the look and feel you want. Vinyl: Vinyl is a cost-efficient solution for your handrail needs. Vinyl handrails provide durability while creating a sleek look. Wood: Wood railings can be added to your existing deck. Wood can be stained or painted to keep a consistent appearance. If you are building a new deck or porch or want to replace your old worn-out handrails, Pro Home 1 can provide the help you need. 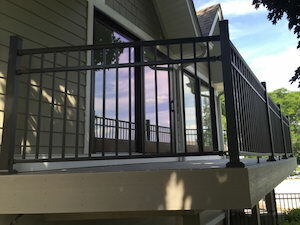 We offer free estimates for handrail installation and replacement to customers in Des Plaines, Arlington Heights, Palatine, Wheaton, Elmhurst, Lombard , Naperville and throughout Dupage, Cook and Lake Counties. Give us a call or fill out our contact form to schedule your on-site consultation and get a free estimate for your residential or commercial project.